NOTE: Member ($77) with guest ($92) will cost a total of $169. TO ADD YOUR GUEST: click on the "ADD GUEST" button at the bottom of the registration form and enter the guest information, as indicated. Thank you. Rather spend a leisurely day exploring the Milwaukee Art Museum, Milwaukee Public Museum or Grohmann Museum while everyone else is at Songs for Nobodies? Register for Independent Study. Members $35/Guests $45. Total registration for member ($35) and adding a guest ($45) is $80. NOTE: Members must register their guests. Optional Group Lunch is available to those who are new or hesitant to joining the trip solo. It is designed to make it easy in making new friends. We will enjoy Sunday brunch in the Pastiche Bistro within the Hotel Metro. Join us for an American premier and the first play of the PLATO 2018-2019 seven-play Milwaukee theater trip series. Coming to Milwaukee from sold-out tours in Australia and the UK--be the first in the U.S. to see this amazing production. 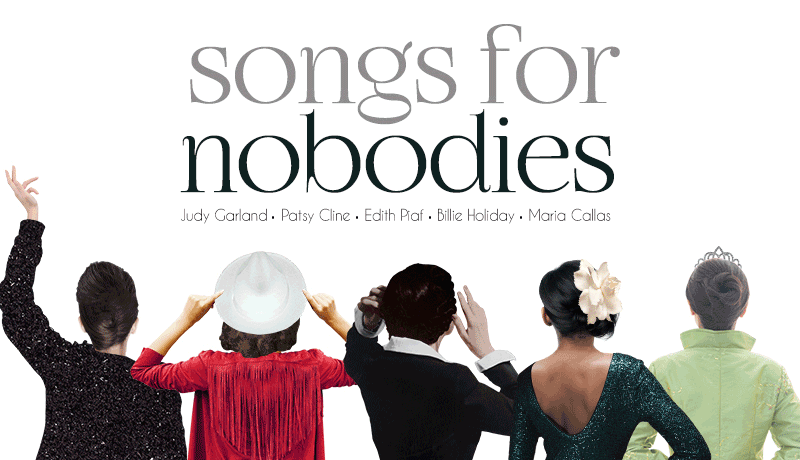 Opening in the newly renovated Stackner Cabaret, the one-woman tour-de-force Songs for Nobodies reminds us that everybody has a story – and a song – worth hearing. Share in the life-changing encounters between legendary divas and the everyday women whose lives they touched, interspersed with the songs that made Judy Garland, Patsy Cline, Edith Piaf, Billie Holiday, and Maria Callas icons of our age. Featuring such favorites as “Come Rain or Come Shine,” “Amazing Grace,” “Non, Je Ne Regrette Rien,” “Ain’t Nobody’s Business If I Do,” and “Vissi d’arte,” Songs for Nobodies shows us the magical power of song. Learn more by visiting the Songs for Nobodies website regarding the cast, video clips of cast performances, interviews & rehearsals, and all the latest news as opening day (September 7) draws near. Songs for Nobodies will be staged in the intimate Stackner Cabaret. Information including photos about this unique theater venue. The Stackner Cabaret is handicapped accessible to the main level and chairs. Most of our seating will be on staggered tables and chairs set on platform deck flooring that are an easy, shallow step-down/step-up between levels of tables and chairs. The backs of the chairs provide good step-down/step-up support. Accessibility Policy. On the Badger Bus, you must be able to climb steps to board and exit the bus. If you need assistance, we require that you bring a friend to give you a hand. Guest Policy. Members must register their guests. Each PLATO member is entitled to bring one non-member guest per bus trip. (Members may bring more than one guest near the registration Deadline Date if seats are available. Check with trip organizer.) Non-member guests pay an additional $15.00 registration fee. PLATO Membership is $60.00/year. *Group Lunch Option is available to those who want to register, but may be hesitant...not knowing anyone and uncomfortable eating alone. The group option lunch addresses this concern and is a good way to make new theater trip friends. Just answer "Yes" to Group Lunch questions on the registration form and we will take care of the rest. Restaurant to be determined. There are a number of restaurants within easy walking distance of the Milwaukee Rep located on both sides of the Milwaukee River and between the Milwaukee Public Market and the Milwaukee Rep. There are nine unique eateries contained within the Milwaukee Public Market. There are also many nearby Third Ward restaurants from which to choose. Tip: Enjoy lunch at another restaurant and return early for dessert and coffee at the Stackner Cabaret. Directions to the Stackner Cabaret: From the Milwaukee Rep’s Wells Street entrance, walk straight ahead to the atrium dome. The Stackner Cabaret is located on the 2nd floor. Take the elevator or escalator. From the 2nd floor elevator exit, walk around to the left into the promenade. From the escalator, you arrive in the promenade. Stackner Cabaret entrance is ahead on the left. Bear in mind that our boarding bus route is like Madison Metro or any other municipal bus service. Please arrive early at your boarding stop so you don’t miss the bus. When everyone is aboard and seated, we leave. Arrive early and we will all arrive in Milwaukee on time to begin our adventure. – Don’t be late. We can wait just 5 minutes at any one location. – Pack water bottles and snacks for sustenance on the trip. 8:30 AM Bus arrives at Oakwood University Woods for boarding. 1:25 PM Return to Milwaukee Public Market for those who need a ride to the Stackner Cabaret and would rather not walk the five blocks to the Milwaukee Rep. Songs for Nobodies Mail-In Registration Form (including instructions). For further information, contact Songs for Nobodies theater trip organizer, Lynne Stapleton, lmastapleton@gmail.com and 920-850-0891.